From the jungle of eucalypts and ferns at the top of the Yarra’s waters to the jungle of concrete that is Melbourne’s CBD, it has been an interesting journey tracking the river from its nominal source at the Upper Yarra Dam to the seaboard finish at Williamstown. And while the bush end was, naturally, the most pristine and beautiful section, slicing through the waters surrounded by fifteen or so paddlers, the city skyline ahead and the Botanical Gardens to our left, proved impressive, too. One thing about the view from on water is that it’s different; it exposes you not only to low-set perspective that immerses one in the environment much more intimately than usual (especially for those of us prone to capsising). It also brings home how important the river and the recreational spaces linked to it are. Wherever there was parkland along the Yarra’s banks, there were users – you could say junkies but of the positive kind: boaters, canoeists, fishermen (and ladies), walkers, runners, cyclists, picnickers, lovers and daydreamers. All of them were getting their kicks from the Yarra and its environs. It brought home to me the importance of green spaces in our harshly constructed, densely packed cities. Further, it brought home the importance of those who look after the green spaces, and so the river: landcarers, volunteers, Friends Of… groups, environmental coalitions, park rangers, Parks Victoria and Melbourne Water. Without them, our green spaces, and the river would disappear. And then? No more daydreaming in the city. On the last day no where was the enjoyment the river brings the public more evident than in the paddlers who joined us from Herring Island for the final stretch. 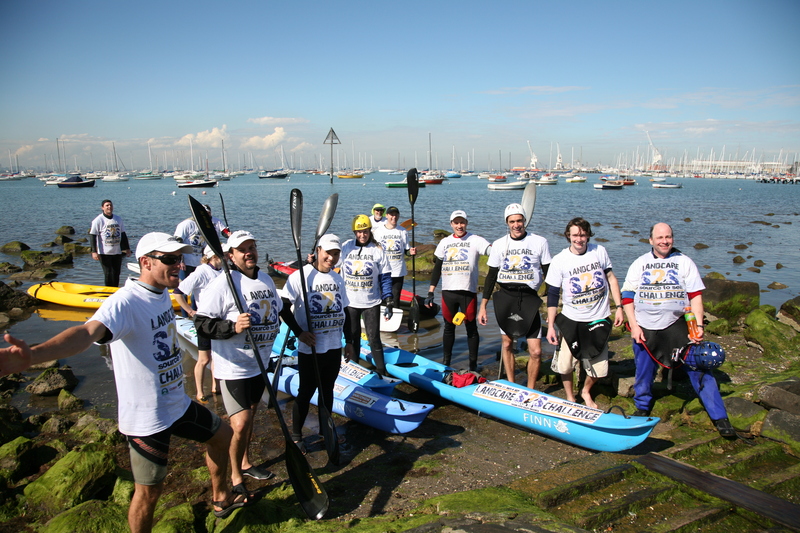 They had the unique experience of paddling past Melbourne’s skyscrapers, through Southbank, alongside the docks and ships and finally into Burgoyne Park at Williamstown. The paddle-armed mob, including Olympian Warwick Draper and adventure racer/team leader Jarad Kohler, grinned like the Cheshire cat in Alice in Wonderland the entire 15km. We were lucky on the day – it was sunny and there hadn’t been any rain. The river was dressed in its Thursday best, mostly clear of rubbish, its sparkles matching the rays glancing off the Rialto building. Had it rained, I’m sure the scenario would have been different: the problem with concrete being that it stops water from seeping into the soil. That water then runs overground, taking with it rubbish and the chemicals left from rubber tyre wear and the like, the pollution running straight into the Yarra. No dirt means no trees, too. No trees mean there’s no filtering system, which again ends in dirty water down the Yarra. Of course, the Yarra’s malaise is not all the CBD’s fault. As we’ve seen over the last six days, there are many and varied issues along its length: environmental flow (too little), non-native species (willows and the like), the clearing of riverbanks (farmland) and the erosion and silting this causes, the continuing outpouring of effluent (better than it once was but still there), pollution from rubbish (hello car tyres, thongs, TVs and litter), pollution from chemicals (be it from industry or simply the rubber and oils from our cars), and general neglect along the banks (hello the section from Doncaster to Fairfield). We made it! The finish at Williamstown. But let’s not get too depressed. The Challenge was about celebration, not protest. It celebrated the many Landcare Heroes working along its length, from the volunteers the likes of the North Warrandyte, Yarra Bend and Don Valley landcare groups, to organisations working hard to clean up the river and inflluence decision makers the likes of Ian Penrose and the Yarra Riverkeepers and Environment Victoria. And from where I sat on the kayak, they’re making a real difference: the majority of the river, like the volunteers, should be celebrated as something of great value to everyone who lives, works and plays along its course. 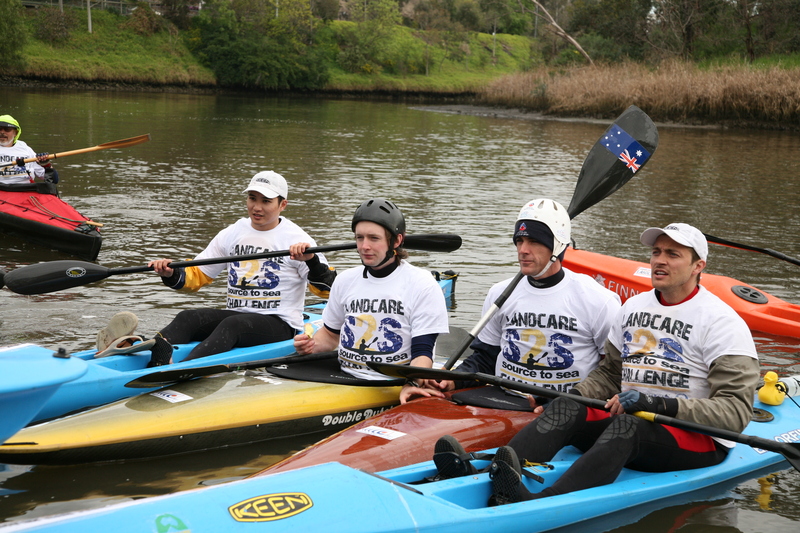 A special thank you to all those who contributed at such short notice to making the challenge happen: Coles supermarkets, Keen footwear, Canoes Plus, Parks Victoria, Environment Victoria, Department of Sustainability and Environment, Yarra Riverkeepers, Yarra4Life, Outer Edge Magazine, Flint Interactive, Pistol Clothing. And of course to Landcare Australia and Coastcare, and all the volunteers and people for which the paddle was undertaken – those out trying to save it.